Not long ago I posted a schematic for what I believe to be one of the simplest oscillators one can build with just a few components. Even though it works perfectly, there’s always place for improvement! This new version employs a “piezoelectric diaphragm” (or just piezo-speaker for short) and a couple more components to enhance the output power. So not only are we reducing the size and weight of the unit but we’re also increasing it’s sound output, neat! The oscillator is still based on a Sziklai pair with feedback, so no surprises there. 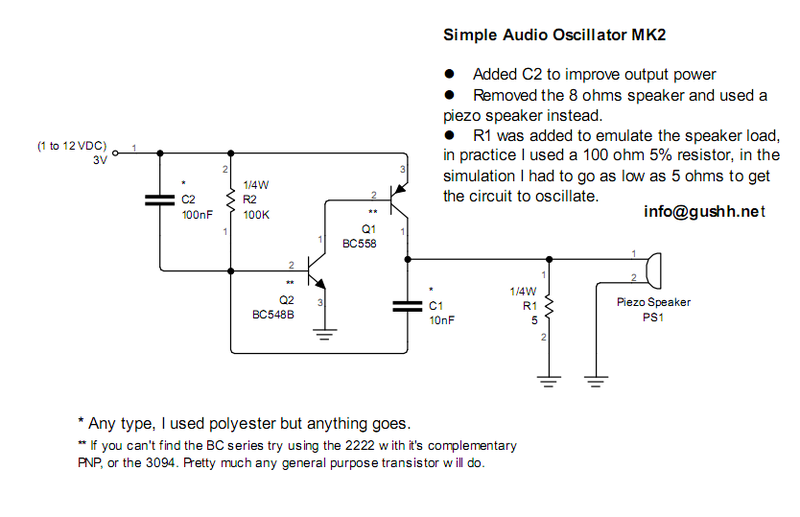 You can also download the PDF: very_simple_audio_oscillator_revised. I’d be delighted to hear about any modifications and/or alternative designs — So feel free to share! « 3D Scanning is fun fun fun!